A contemporary artist based in Saskatoon, Jan Corcoran is curious, intuitive and strongly influenced by music. Educated in BC and Saskatchewan, she earned a Bachelor of Fine Arts with Great Distinction from the University of Saskatchewan in 2007. Jan’s work has been shown in group and solo shows since 1996, and is in private collections in Canada, the United States, Great Britain and the Bahamas. I met with Jan while she was in Victoria on vacation. When speaking about art and creativity her passion is evident, her hands painting the air, as if holding an invisible brush. I consider myself a mixed media artist inasmuch as I use some collage, acrylic, oil, some gold leaf… different materials. What percentage of your work is abstract vs. representational? You know, that really varies. The majority of my work is abstract. That’s where I get my kicks, that’s where I’m passionate. It’s more like playing for me, looking at those colours and seeing what’s going to go with what, and what shapes are blending in. But I find it can be quite a good balance… landscapes make me more focused. They’re not realist, they’re sort of impressionist. How much do you plan a painting in advance, does it evolve as you’re working on it? More or less, yes. Do I plan ahead – not really. My stuff evolves as it goes down on the canvas. And it can totally change, I can have three paintings underneath on one canvas and then I’ll scratch back through that so some of it comes forward… so there can be a lot of play in the canvas on a given painting. Your web site describes your work as “a west coast perspective on prairie landscapes.” Can you explain that? We lived in Victoria for 20 years, and then moved to the prairies. For the first six months I really felt like I was living in a bubble. The prairies are relatively flat and I felt like there was this big glass bubble over me. Then I started really paying attention to the prairie and how much it’s like the ocean. It’s always evolving, always changing. The mood, the colours are always changing, just like the ocean. You know, tides come in and go out, the waves come in, the sky is always changing… and the prairies are like that. And they have the big sky, which I love. You can see the storms coming in. I’d never seen a tornado, they’re amazing – especially when they go right overhead, and the sky is a turquoise green colour, it’s phenomenal. The first time I saw one I didn’t know what it was and I was out there with a camera and someone said do you know that could have come down at any second?! But it was so beautiful. And then of course I had to paint it! So you really started painting seriously when you moved to Saskatchewan? I’ve always done art. Not seriously, but played with it for many years. When I was in Victoria and the kids were in school, at night I would paint and do the proverbial kitchen table thing where you have to set it up and take it down. Then we moved to Saskatchewan and it just seemed easier to paint. So that was when I decided to take a BFA. I had been playing with abstract, and my third year painting prof said “if you’re thinking of doing anything different now is the time to do it, because you have your peers for support.” It was an a-ha moment for me. That’s when I went for it, and got into the abstract. It really set me on fire. For some reason getting a prof’s permission to just go – go with what you’re feeling and do it – that was fabulous, amazing. Are you inspired by music? Yes, very much so. I always have music on in the studio. If I’m not listening to Jian Ghomeshi on CBC then I’m listening to music. If a painting’s going along, particularly the abstracts, and all of a sudden I’m getting too tight, and the music changes, it literally does change the whole direction a painting is going. There’s something about music and colour and shape, it all goes together, doesn’t it? If you’re listening to music you’re moving, and this is what painting is – It’s moving. The energy that comes into it when you’re listening to music, that’s where it comes from. My painting, Space Junk… I was getting frustrated with it, and I just put my music on and suddenly knew what I was going to do. I put down huge gobs of paint and decided I need to get that blue in there. There’s an overwhelming feeling of energy you get, when it doesn’t matter what you do, it’s right. And you can’t put a thing wrong. You get going and get passionate and you can feel it, and you just know it’s working. You just paint. It comes from music… inside… inspiration. Letting go of all that stuff that’s juggling about in your brain and just painting. Just painting. Pure artistic and creative energy. Do you play a musical instrument or sing? I’m always interested in how different art forms influence each other. They do, very much. My husband is a bluegrass musician. There’s always music in the house, and I’ve always loved music. I have a huge eclectic collection on my iPhone, everything from Mozart or Beethoven, all sorts of classical music, to Tom Petty, Serena Ryder, lots of different things and all on shuffle, so it just depends which song comes up, which direction the painting is going to go. When you’ve had a particular emotion or something that was in you when you were painting, do you hope the viewer will pick up on what that was? No. it’s interesting you should ask that, because we just had this discussion last night. These friends of mine just bought one of my large abstracts and they said ‘you haven’t signed it, why don’t you sign it?’ I always sign them on the back, but I don’t sign the front because the viewer might look at it in a vertical and really like it but then you might put it in a different space and flip it to a horizontal and it speaks a whole different language. If I put my signature in the lower corner and you want to hang it upside-down, it would look pretty silly. So I always sign them on the back. I always think, what engages the viewer? What engages me as a viewer? There’s got to be something, or you’re just going to glance at it and move on. There’s a memory attached to it… it’s pulling a visual memory of something, whether it’s a colour that was a childhood colour for you, a good memory –it might be a sad memory, but there’s something in that work that engages you. I’ve had people say to me “I don’t like abstract, I don’t understand it, but I love your work and I don’t know why.” There’s a memory. It could be in your subconscious – it doesn’t have to be “this reminds me of” but there’s something in the cerebellum that’s engaging you to pay attention. To draw you in. 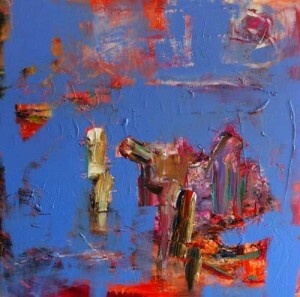 What about people who say they don’t “get” abstract art… is it a case of letting go of expectations? That’s exactly right. Completely right. You’re not supposed to get it. With representational art, you don’t have to really think about it. It is what it is. It’s a tree, it’s a house, whatever. Again though, you’re connecting to a memory. There’s something in it, it’s not that every representational piece is going to draw you in, you connect to something. I always say I want you to bring your own story to this. Allow your imagination to just float and find a story in there. It’s your story, not mine. What are the benefits of working as a professional artist in Saskatchewan? Saskatchewan has a record of being very supportive of its artists, and it’s very much in evidence as an artist there. I’m in a studio with eight other artists, we all have our own space, it’s an amazing setting. There’s just this energy that happens. It’s not competitive. What has been your biggest challenge as a professional artist? When you do it for long enough, some things that were challenges before aren’t challenges anymore. When I go through a period of down time, maybe I’ve just done a show and I’m sort of burned out, that used to be a real challenge – to get back into it and start painting again. You just have to do it. Get something down. Now I know I can go through that. Probably the biggest challenge for me at this time in my life is finding the time to get into the studio. Life interferes. The other challenge is trying to spend the time doing the grunt work. I hate writing for shows. I know I should do it more. I keep hoping I’ll be discovered and they’ll do it for me! I’m not good at it. You’ve got two very different sides of it. My brain doesn’t work well on the other side! What would be your advice for young or up-and-coming artists? Somebody asked a particular painter, ‘is this your best work ever?’ And the painter said ‘no, my next piece is going to be my best piece ever.’ And I thought, what a telling remark. You know, I would never put something out there unless I felt good about it, but that’s what keeps you going, knowing that next piece might be the one that makes you famous! My advice, for what it’s worth, is to just go for it. Go for it. Don’t worry about what other people think, just do it. You’re never going to do it if you become inhibited. You’ve just got to do it, and do it for yourself. Not that I haven’t had my inhibitions and lack of confidence in what I’m doing, but for the most part, without trying to sound arrogant… I know what I do and I know I do it fairly well. I think that comes through, in painting, in writing, in music. That confidence of knowing what you’re doing is good. It may not be brilliant, but it’s good. Thank you, Jan, for such an interesting and inspiring conversation! 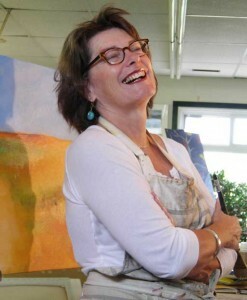 Be sure to visit Jan’s web site to see more of her work. All images courtesy of Jan Corcoran. ← Maureen Washington: Music Giveaway! 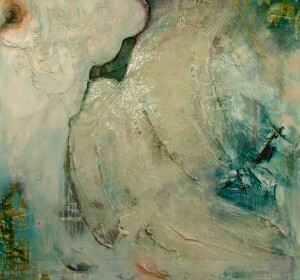 It is so inspiring to see a wife/mom going back to school to get her BFA, then working in studio with 8 other artists. Truly fabulous. Stopping by from SITS.